Running a digital project can mean you’re juggling numerous tasks. Projects can be ever-changing and just as you’re nearing the end, often opinions are canvased across your client’s business, inevitably leading to a tweak here and there. Mounting tweaks can soon turn into bigger jobs which significantly impact your margins. But when changes are drip fed, this impact can be hard to see and measure. 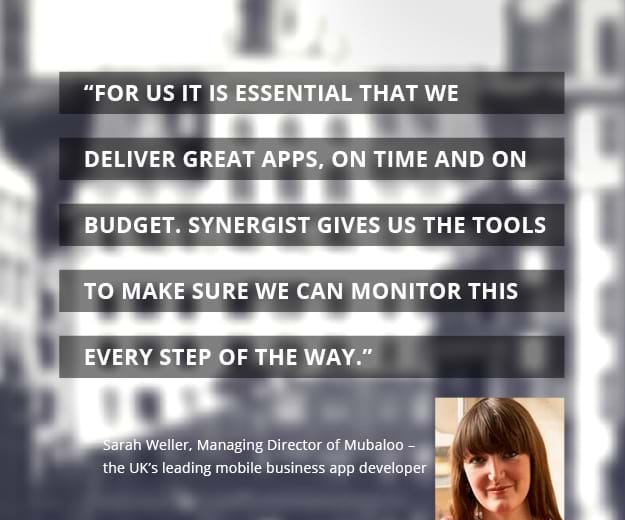 Synergist can help. Bringing some calm and clear-headed thinking to the table so you can run your business on fact, driving more fact-based conversations with internal teams and clients. By giving you control and live visibility of everything from detailed estimating to job and client profitability to scheduling and capacity planning and billing and reporting. It's all in one place, so everyone’s looking at the same up-to-date information. Leaving you with honest and reliable knowledge to aid your conversations and decision-making with clients.